Warning! Cookies must be enabled for proper operation of the website. Our Washington Space Saver-1 All-On-One Labor Law Poster combines mandatory Washington and federal notices onto a reversible (horizontal or vertical display) full-color 25.5" x 39.5" poster. 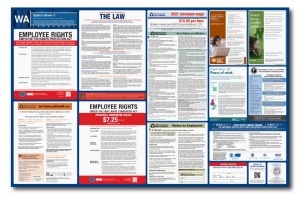 Get the updated labor law poster for Washington today to signify your compliance with all federal and state posting requirements and to avoid costly fines. This exclusive, copyrighted poster is protected by our $35,000 "We Pay the Fine" Reimbursement Guarantee in Washington against government fines for non-compliance. You'll also receive a personalized Certificate of Compliance (within 30-45 days) to post next to your labor law poster. This certificate transfers the burden of posting compliance to our firm and explains the terms of our guarantee. Eliminate the stress of staying on top of labor law posting requirements in Washington. With a one-year subscription, you will automatically receive updates to your poster whenever a mandatory posting change occurs. Generally, two or three updates take place yearly in labor law posting requirements. The subscription will ensure that you stay in compliance and not void your Labor Law Posters Online "We Pay the Fine" Guarantee.